This is a typical concrete Foot Bridge. This kit contains 59 plastic parts in 3 colors, 5 transparent parts and green flocking foliage. 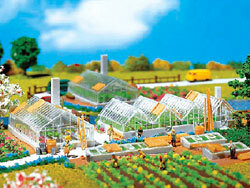 It is greenhouses, pallets, beds,and small details ( ladder , wheel barrel, barrels , and cans) . All the tenants in this multi-story apartment building have their own balcony where they can plant flowers or just relax and enjoy the sun and fresh air. This modern structure is ideal for cities or at the outskirts of a suburban residential area. With a swirl of motion and bright lights, this operating ride will animate any midway. This colorful kit is perfect for any fair midway, carnival or amusement park scene. It’s complete with motor and can be illuminated with light set #272-180671, sold separately. With a swirl of motion and bright lights, this ride will animate any midway. This colorful kit is perfect for any fair midway, carnival or amusement park scene. With a cookie and fried chicken booth. This colorful kit is perfect for any fair midway, carnival or amusement park scene. The whole family will have fun in this rustic-style play land. Set includes tables, benches, swings, seesaws, climbing structure, adventure hut, sand pit, a wooden train and more. Revolves clockwise or counterclockwise. Will operate the Faller Sawmill, Windmill, Watermill or Oil Pump (each sold separately).